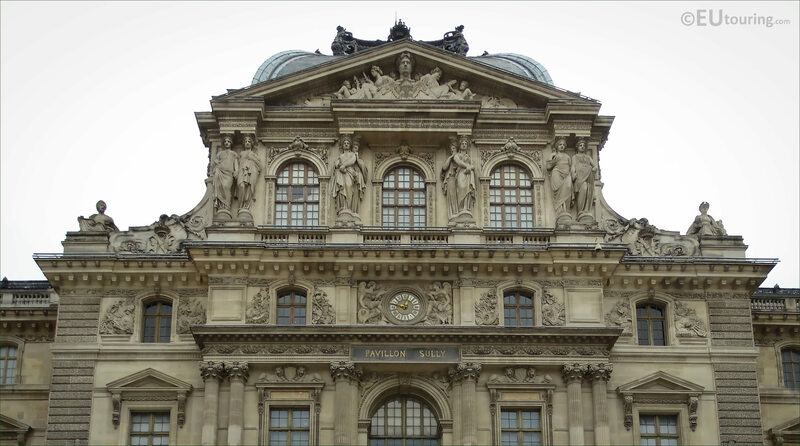 We were at the Musee du Louvre in the 1st Arrondissement of Paris, when we took these high definition photos showing a pair of Caryatids statues by Pierre Simart, which are located on the Pavillon Sully. Now caryatids, spelt cariatides in French, are decorative sculptures used as architectural supports instead of columns or pillars, and these have been used for many centuries, and the earliest known ones you can still view today are to be found in Athens. However, this particular set of caryatids was only put in place on the former Palais du Louvre back in 1857 when the palace was undergoing a major renovation and numerous additional embellishments were being added to its facades. 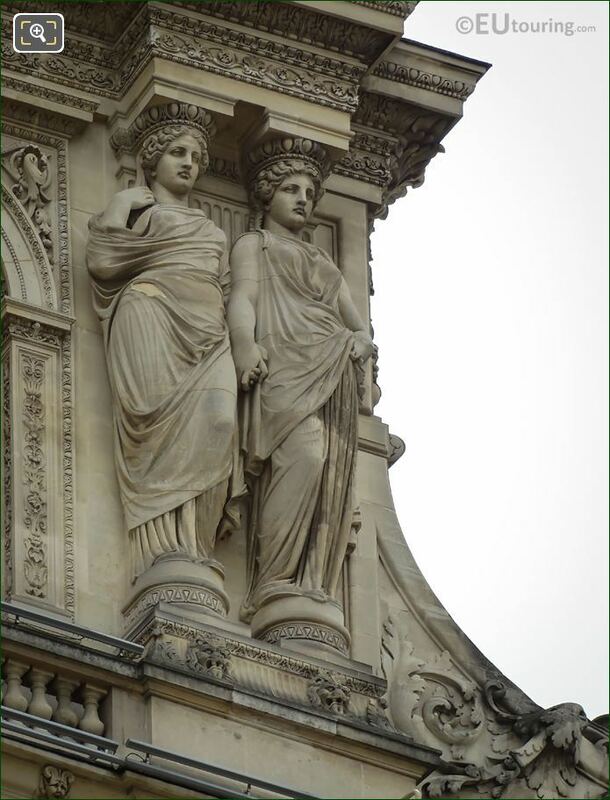 This next photograph actually shows the location of these caryatids, which is on the Pavillon Sully as you can tell from the plaque below the clock on the impressive pavilion of this famous tourist attraction in Paris. And these particular sculptures are positioned on the far right hand side of the upper level by the dormer windows supporting the entablature and pediment that can be viewed from the Cour Napoleon courtyard, which is where you will find the more modern addition of the I M Pei pyramid. 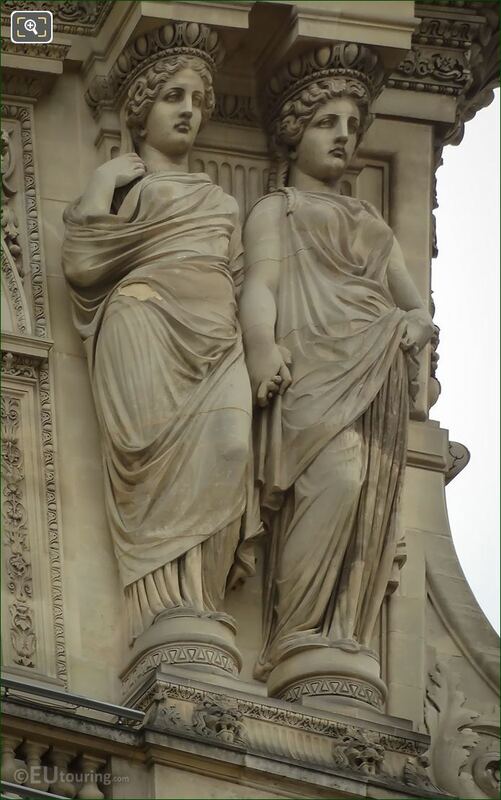 Yet this last photo shows a close up of the set of caryatids, which unfortunately do not normally have names attached to them, like many of the other statues on The Louvre, but these particular ones were sculpted by Pierre Charles Simart, who was born in Troyes in 1806 and studied to become a French sculptor. 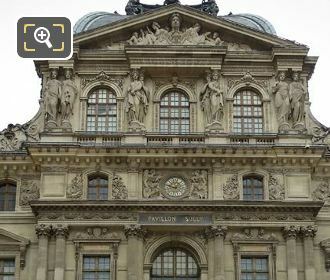 So having been able to study in Paris, Pierre Simart managed to win the Prix de Rome and furthered his studies at the Villa Medici in Italy before returning to the capital where he started to receive numerous public commissions including working on the Tomb of Napeon at Les Invalides and of course on the Louvre. However, unfortunately, his life came to a tragic end, as he died in 1857 through getting complications after a fall from an omnibus, and although some statues and sculptures can still be found in Paris, the majority of works by Pierre Charles Simart are now held within the Tryes Museum in his home town.